Olaf’s Frozen Adventure has been put on ice. Disney has directed theaters running Coco, Pixar’s latest, to remove the deeply unpopular 22-minute Frozen short that plays in front of each screening. The removal goes into effect on Dec. 8, sources familiar with the matter confirmed to Mashable. The request from Disney also asks that theaters use the newly freed-up time to hold extra screenings of Coco each day. Pixar movies generally open with a completely unrelated short film, usually running no more than 10 minutes. Olaf changed the game somewhat, between its length and its reliance on a Disney Animation Studios hit (Pixar’s shorts are generally homegrown). The Frozen short has been especially problematic for a number of reasons. Length is the biggest issue, of course, since the actual movie doesn’t start until 40 minutes after the advertised time, between trailers, ads, and Olaf. That’s a lot of extra sitting around for an audience comprised primarily of kids expecting a story about music and family, set against the backdrop of Mexico’s Dia de los Muertos. Initial principal casting has been announced for Broadway’s Frozen, the new musical based on Disney’s Academy Award-winning musical film. As previously reported, the show will play the Denver Center for the Performing Arts’ Buell Theatre August 17–October 1 before arriving on Broadway in spring 2018 at the St. James Theatre. 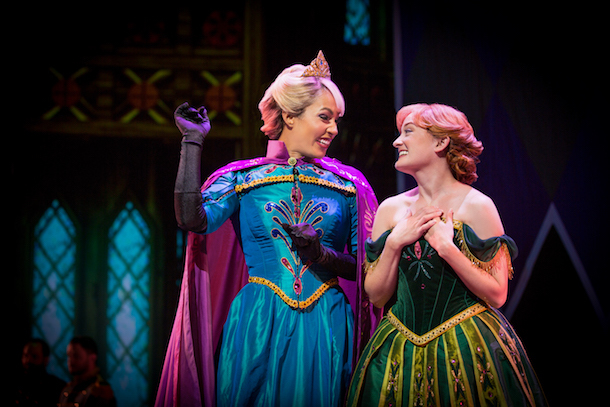 The cast will be led by Caissie Levy and Patti Murin as Arendelle’s royal sisters. Levy, who last appeared on Broadway as Fantine in the revival of Les Miserables, will create the role of Elsa, a young woman wrestling with powers beyond her comprehension or control (voiced on screen by Idina Menzel). Levy’s additional credits include Ghost and Hair, both in the West End and on Broadway, as well as Broadway’s Wicked and Hairspray. Murin, who made her Broadway debut in Xanadu and has since appeared on the New York stage in Lysistrata Jones, Lady, Be Good!, and Love Labour’s Lost, will star as Elsa’s younger sister Anna, who tries to reconnect with the person once closest to her. The two will be joined by Greg Hildreth (Peter and the Starcatcher, Cinderella, Bloody Bloody Andrew Jackson) as Olaf, Robert Creighton (The Little Mermaid, Anything Goes, Off-Broadway’s Cagney) as Duke of Weselton, John Riddle (The Visit) as Hans, and Jelani Alladin in his Broadway debut as Kristoff. Additional principal and ensemble casting will be announced soon. Tony winner Michael Grandage (Red) directs the production. Producers also announced April 17 that Tony Award winner Rob Ashford has joined Frozen’s creative team as choreographer. Christopher Gattelli, previously announced as choreographer, has chosen to leave the show ahead of rehearsals in June. Ashford is a Tony winner for Thoroughly Modern Millie. Single tickets for the Denver engagement, which start at $25 with a limit of eight tickets per account, will go on sale May 1 at 10 AM MT at DenverCenter.org. Tickets for the Broadway production will go on sale later this year. In spring 2018, Frozen will join Disney Theatrical’s other Broadway mainstays The Lion King and Aladdin. Broadway dates will be announced at a later date. Levy and Murin were previously announced to play Elsa and Anna in a developmental lab. The new musical features music and lyrics by the creators of the film’s score, Kristen Anderson-Lopez (In Transit, Up Here) and EGOT winner Robert Lopez (Avenue Q, The Book of Mormon, Up Here), and a book by Jennifer Lee (Wreck-It Ralph), the film’s screenwriter and director (with Chris Buck). 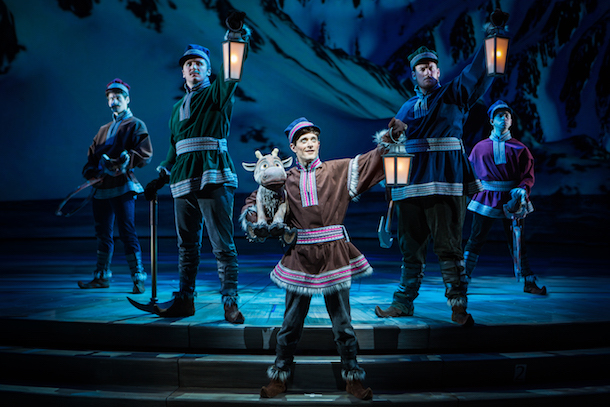 The design team for Frozen includes Tony- and Olivier-winner scenic and costume designer Christopher Oram (Wolf Hall Parts 1 & 2, The Cripple of Inishmaan, Evita), Tony-winning lighting designer Natasha Katz (Aladdin; Hello, Dolly! ; An American in Paris), and sound designer Peter Hylenski (The Scottsboro Boys, Motown, After Midnight). Two-time Tony Award winner Stephen Oremus (Avenue Q, Wicked, The Book of Mormon) is music supervisor and creates vocal and incidental arrangements. Frozen won two Oscars in 2014: Best Song (“Let It Go”) and Best Animated Feature. For the “first time in forever,” the beloved animated hit “Frozen” is getting the Disney Cruise Line theatrical treatment as a new stage show exclusively aboard the Disney Wonder. “Frozen, A Musical Spectacular” debuts, along with a wave of new enhancements to the ship, on cruises starting Nov. 10, 2016, from Galveston, Texas. The story will be presented like never before, with an innovative combination of traditional theatrical techniques, modern technology and classic Disney whimsy, completely unique to the Disney Wonder production. “We’re so excited to bring ‘Frozen, A Musical Spectacular’ to the stage of the Walt Disney Theatre on the Disney Wonder. The production is going to delight each one of our guests because it’s a story for absolutely everyone in the family,” said Jim Urry, Vice President, Entertainment, Disney Cruise Line. “Frozen, A Musical Spectacular” will follow the captivating adventure of royal sisters Anna and Elsa as they embark on a journey to discover the meaning of sisterhood, inner strength and true love. Fans of the film and newcomers alike will be enchanted by favorite characters brought to life onstage along with beautiful renditions of the movie’s iconic music. The show features dynamic costumes and sets, remarkable special effects, and spectacular production numbers that will delight Disney Cruise Line guests in new and surprising ways. The creative disciplines blend to create a seamless environment – blurring the lines between costume and scenic, set piece and video, puppet and puppeteer – and expand upon the most imaginative elements of the film. “The story of ‘Frozen’ is one of the most iconic animated movies ever, so this is a unique and special opportunity to retell the story onboard the Disney Wonder, transporting guests right into the world of Arendelle,” said Kevin Eld, Creative Portfolio Executive, Walt Disney Imagineering. To adapt this blockbuster animated feature into a quintessential stage production, Eld assembled a team of distinguished creative talent with Broadway credits and theatrical accolades. The production is led by Tony Award-nominated director Sheryl Kaller (“Next Fall,” “Mothers and Sons”). Joining the creative team are Tony Award-winning costume designer Paloma Young (“Peter and the Starcatcher”), choreographer Josh Prince (“Beautiful: The Carole King Musical”), scenic designer Jason Sherwood (“Paint Your Wagon”), and writer Sara Wordsworth (“In Transit”). “Frozen, a Musical Spectacular” will feature music direction by Marco Paguia, projection design by Aaron Rhyne and lighting design by Rui Rita. Dynamic puppetry by Michael Curry, whose designs are featured in Disney’s Tony Award-winning Broadway musical “The Lion King,” will bring exciting physicality to characters like Sven and Olaf. The production features the popular music and lyrics by the creators of the “Frozen” film score, Kristen Anderson-Lopez (“In Transit,” “Up Here”) and Robert Lopez (“Avenue Q,” “The Book of Mormon,” “Up Here”), and is adapted from the screenplay by four-time Tony Award nominee Chad Beguelin (“Gotta Dance,” “Aladdin,” “The Wedding Singer,” “Elf”). A stand-out moment, the emblematic ballad “Let it Go” will be transformed into a full-fledged stage spectacle. Complete with real-life magic – transformative scenery, snow flurries and state-of-the-art video technology – this show stopping number will bring Elsa’s enchanted icy blasts to reality like never before. “Frozen, A Musical Spectacular” is based on the Walt Disney Animation Studios “Frozen,” which is the number one animated feature of all time. The acclaimed film earned two Academy Awards (2014) for Best Animated Feature and Best Original Song. The hottest, or dare we say, coolest ticket in Disney California Adventure park is “Frozen – Live at the Hyperion,” now playing daily in the Hyperion Theater in Hollywood Land. And if you’d like to take your viewing experience to the next level, reservations are now open for three pre-show packages that include priority seating at select performances plus special experiences before and even after the show. The Frozen Pre-Show Package lets you chill with family and friends while enjoying refreshments, photo opportunities and more at a festive, “Frozen”-themed celebration before the live show. This one-of-a-kind gathering commences inside Stage 17, transformed into a castle courtyard in the wintry world of Arendelle with “Frozen” delights sprinkled all around, including a shave ice treat for you to enjoy. When the magical reception winds down, you’ll be whisked off to the nearby Hyperion Theater and land in your priority seats. The Frozen Pre-Show Plus Lunch Package includes the pre-show experience and priority seating, plus a melt-in-your mouth dining experience at Carthay Circle Restaurant. You can savor a three-course meal that includes your choice of four stunning main course dishes. There’s also a special kids menu, but everyone big and small should save room for a sweet “Frozen”-inspired dessert. And for the ultimate viewing experience, go for the Frozen Signature Dining & Behind-The-Scenes Package. This is an incredible offering custom designed for the biggest “Frozen” fans, which includes not only the pre-show celebration and priority seating, but also an exclusive behind-the-scenes experience at the Hyperion Theater following the performance. You’ll then cap off the experience with an elegant four-course dinner at Carthay Circle Restaurant. For further details, availability dates, pricing and reservation information for each of these packages, visit the “Frozen – Live at the Hyperion” page on Disneyland.com. Separate theme park admission required and is not included in the package price. Space is limited and advance registration is required. Full payment is due at time of booking and cancellation policies apply. No discounts. Subject to restrictions and change or cancellation without notice. Disney is opening up the gates, and for the first time in forever guests can be swept away by a full-scale theatrical interpretation of “Frozen” on stage at the Disneyland Resort. “Frozen – Live at the Hyperion” officially opens today, bringing to the stage all the heart-warming emotion of Anna and Elsa’s story, along with show-stopping production numbers, elaborate costumes, special effects, surprising scenic transformations and a few unique theatrical twists. Of course, nothing beats the magic of experiencing live theater for yourself, so you’ll definitely want to catch a performance on your next visit. 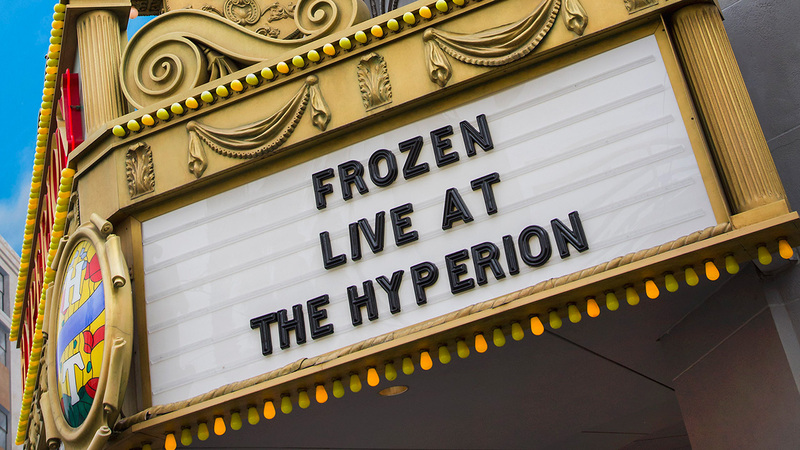 “Frozen – Live at the Hyperion” is now playing daily in the beautiful Hyperion Theater at Disney California Adventure. Disney has just announced that Frozen Ever After at Epcot will open on June 21st. Also opening June 21 will be Royal Sommerhus, the Frozen meet and greet venue. Located in the Norway pavilion at the park, Frozen Ever After offers guests an adventurous boat tour through the kingdom of Arendelle. Guests are first transported to the “Winter in Summer” Celebration where Queen Elsa embraces her magical powers to create a beautiful “winter-in-summer” day for the entire kingdom. Next, guests will pass Troll Valley on their way up the icy North Mountain to Queen Elsa’s Ice Palace before their return trip to the Bay of Arendelle. In summer 2016, Disney Cruise Line guests can immerse themselves in the animated hit “Frozen” with exciting experiences inspired by the film, including a spectacular deck party, storybook adventures ashore, a three-song stage show production number, character meet and greets, and more. Other shore excursions take Disney Cruise Line guests to discover the breathtaking natural wonders, stunning architecture and rich Scandinavian culture depicted in the film. Seven-night voyages begin May 29, 2016, sailing through Norwegian fjords and calling on ports including Stavanger, Ålesund, Geiranger, and Bergen, Norway. Adding to the excitement, offerings debuted in 2015 continue this summer and beyond. Disney announced on Thursday the release of a new Frozen-themed game aimed at children that allows users to enter and create their own versions of the world seen in the popular animated movie. Titled Disney Build It: Frozen, the player constructs and customizes various buildings inside a snow globe, letting their imagination run wild. The app starts off with a brief tutorial to show the player how to drag and drop the various Frozen buildings, starting with Elsa’s Castle. The player adds their favorite colors to the buildings and customizes them with different roofs and chimneys, then watches them appear before their eyes. Along with Elsa’s Castle, the player can construct other buildings, including Wandering Oaken’s Trading Post, Arendelle Towers and much more. The user is able to visit locations as seen in the movie, like the North Mountain, the Forest, Troll Valley, Arendelle Castle and the town of Arendelle. Building certain structures will cause some of the movie’s popular characters (Elsa, Anna, Olaf, Sven and Kristoff) to join the environment. These characters appear with an adorable snow globe that will warm the player’s heart as they explore their icy world. These characters can wander around the snow globe, dance, play and celebrate with the player, but the user can slide them to whatever location they please. Once a building is created, the user earns snowflakes for props to add to the landscape of their globe, such as a snowman or snow-covered trees. The gamer can also unlock a new character called Snowgie, a small snowman creature that will accompany the player on mini-missions. Once the player finishes building their world, they can use Apple’s 3D Touch feature to activate a flythrough mode to be able to see the entirety of their snow globe creation. Players can build multiple snow globes and use the Home Screen Quick Actions to instantly jump into them. With its lovable characters, easy gameplay and magical soundtrack, this new game will surely captivate Frozen fans for hours on end. Disney Build It: Frozen is now available to download for iOS and Android for $3.99 with in-app purchases.